James Nash's return to the British Touring Car Championships hasn't been as successful as he would have liked after yet another torrid weekend, this time at Thruxton. The Newport Pagnell man has found life hard back in the BTCC after a handful of lowly results in the opening two rounds. But at Thruxton - the fastest circuit in the country - the problems with his BTC Norlin Honda Civic were highlighted. 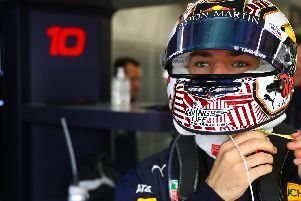 Suffering handling problems throughout the weekend, he could only qualify 20th on Saturday, before limping to 23rd, 21st and 23rd finishes in Sunday's three races. Nash said his issues were improved slightly in Race 2, but hopes to progress further in Race 3 were dashed on only the opening lap when another car used Nash's Honda as a brake, smashing the front air splitter, a door and a rear wheel in the process. "There's not much I can say after such a disappointing weekend," he said. "For a variety of reasons we haven't been able to test. All our testing has in effect been undertaken during actual race weekends which, is far from ideal. "We've got a good team of guys here at BTC Norlin Racing but, until we can sit down, analyse performance data and go and test properly nothing is going to change. "I would though like to thank Dunlop for making such robust tyres. I had a vibration to manage in race three after the opening lap clash but I had absolutely no idea that one of the rear wheels had been smashed. "How the tyre stayed on for the next 15 laps when we're pushing 130 mph through Church Corner I'll never know but I am very grateful that it did."